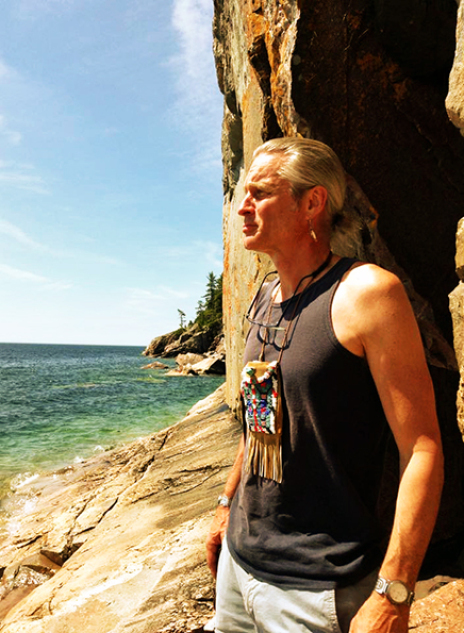 "Seeing in a Spirit Way"
Today, I am pleased to present part 15 of a blog series connecting my jewelry and graphic art as well as artwork by kindred artists with the Seven Grandfather teachings of the Ojibwe Anishinaabe People. These Grandfather Teachings, kept safe for thousands of years by countless generations of Medicine People of the the Anishinaabe Peoples, are passed down orally and from the sacred birch bark scrolls that still exist today. Today's blog story features not only two silver eagle feather ring sets of my own making but also a powerful canvas of the late Odaawaa-Ojibwe artist Randy Trudeau from Manitoulin Island, Ontario. The painting, which he created in 1990, is titled "The Young Warrior and His Vision." Migizi, the Bald Eagle, symbolizes in our culture virtues like courage and pre-knowledge and is therefore emblematic of leadership. The Anishinaabeg regard Migizi as gimishoomisinaan, our Grandfather, and a special messenger of GICHI-MANIDOO, the Supreme Spirit Being of the Universe. His sacred feathers, which are animated by his vision, strength, and courage, have always been used as offerings and as decorations for ceremonial costumes and regalia. To be given an Eagle feather is one of the greatest honors to receive because it recognizes achievement and great acts or deeds. According to Anishinaabe tradition, Gimishoomisinaan Migizi (Our Grandfather Bald Eagle) was a long time ago chosen by GICHI-MANIDOO (the Great Mystery) to represent the Teaching of Zaagi’idiwin (Love). GICHI-MANIDOO, after creating Aki, the World, spoke about the importance of mino-bimaadiziwin, living a life according to the Seven Grandfather Teachings. 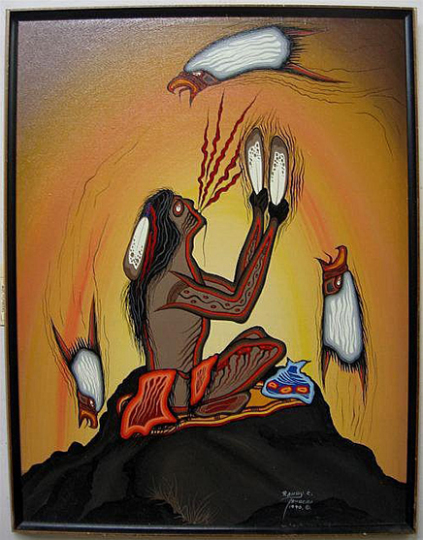 Gimishoomisinaan Migizi became inspired and told Great Mystery that he, since his feathers symbolized the intermediate region between things of the spirit world and the earth, would like his feather to be gifted to the Anishinaabe person who’s the most brave and guided the most by the Teachings. As the eagle is anami'ewin mizhinawe, a prayer carrier of messages and giving thanks, healers who belong to the Medicine Lodge of the Anishinaabe Peoples sometimes envision themselves turning into eagles as they pray for another person and to GICHI-MANIDOO, the Great Mystery, asking the eagle to carry the sickness up to GICHI-MANIDOO in order to heal the patient. So highly esteemed were his spiritual powers that in the old days, an Anishinaabe person would never gaze up to a flying eagle without offering a prayer with asemaa (the sacred tobacco) in his or her hand! The inlaid, respectively appliqued, wing feathers of the above sets silver wedding rings, which I titled Waaseyaabindamowin Miigwan (Vision Feather) and Manidoo Waabiwin (Seeing in a Spirit Way, literaly: spirit-seeing), symbolize manidoo (spirit), reminding the wearers of the rings that eagle feathers, regardless if they are from the bald eagle or the golden eagle, have the power to convey human thoughts and feelings and provide persons with an opportuni­ty to speak directly to the spirits with debwewin (a straight mind) and bekide’ewin (a pure heart). The marquise-cut, sparkling blue sapphire adorning the feather of the Manidoo Waabiwin ladies' ring represents the eagle's vision, emphasizing that he flies high above the earth and sees all that is sacred and true. 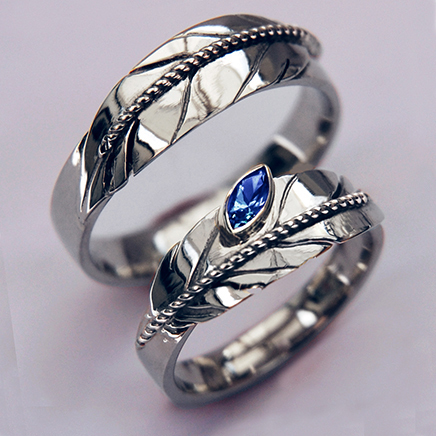 Click here to view details of the Waaseyaabindamowin Miigwan ring set. 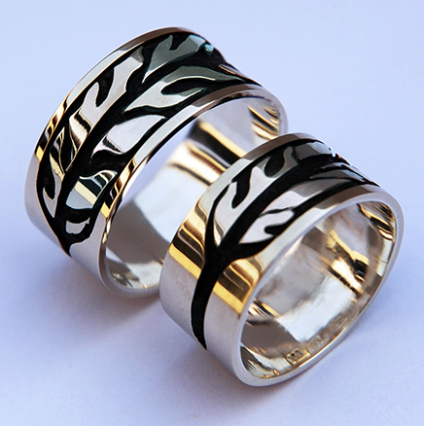 Click here to view details of the Manidoo Waabiwin ring set. Giiwenh. So the story goes about the eagle feather wedding ring sets that are featured here today and about the symbolic meaning of the eagle feather. Miigwech gibizindaw noongom mii dash gidaadizookoon. Thank you for listening to me today. Giga-waabamin wayiiba, I hope to see you again soon.